WHAT: IMPERIAL FRIGATE WRECK WHERE: OSHIMA ISLAND, JAPAN | EXCAVATION: 2007-2012 | DATE OF WRECK: A.D. LATE 19TH C.
The Imperial frigate Ertuğrul was constructed in Istanbul 1889 A.D. and sank during a diplomatic visit to the Japanese Emperor in southeastern Japan in 1890. All but 69 of her 609 crew and their commander were lost during the typhoon that destroyed the frigate. 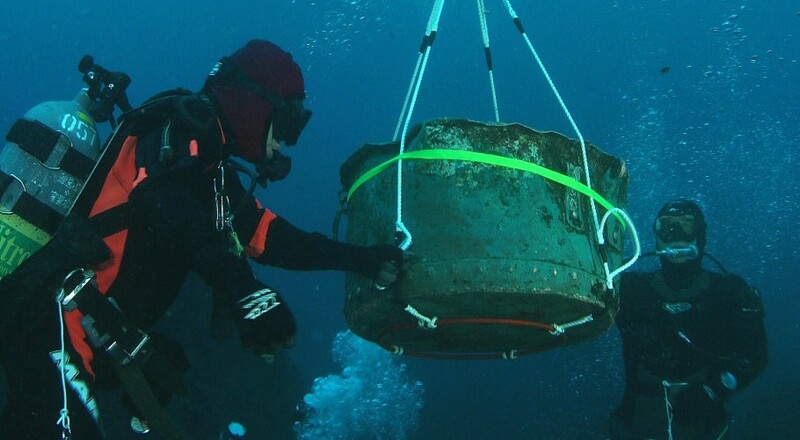 2008 marked the first season of excavation at the wreck site, and by the end of the six-week season, 144 individual dives were made in two excavation areas, and more than 1000 artifacts were raised, registered, and cataloged. The recovered artifacts, including porcelain, glass, and especially copper alloy objects such as nails and screws, form a varied and impressive collection despite the fragmentary nature of most material in surface layers of this very disturbed site. A few fragments of decorated thin lead or pewter plates depicting people in a mountainous landscape could have been among the presents the Japanese Emperor was sending to the Ottoman Sultan. More complete pieces as well as personal effects were becoming more common as deeper levels were reached towards the end of the season, and next year should yield even more objects of interest, including items that illustrate the lives of the victims and serve as reminders of their untimely deaths. The most compelling discovery of the season was also a poignant reminder of the human tragedy these recovered materials represent. This was a fragment of a human skull along with a finger or toe bone. These finds were not treated as archaeological objects, and it was decided by the project directors in consultation with Turkish and Japanese authorities to bury the remains with the rest of Ertuğrul’s dead that rest in peace in a Turkish monument on Oshima Island.The event was accompanied by an Islamic burial ceremony held on location by the Turkish Iman from Tokyo. The Turkish Military attaché in Japan, Japanese dignitaries, and the project participants attended the ceremony. 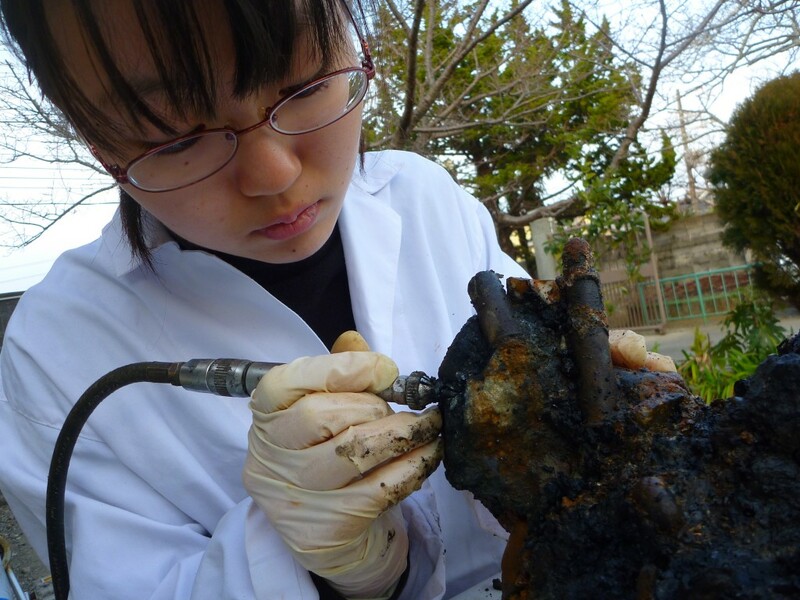 ABOVE: Student from Wakayama, Ms. Kaizu, removes concretions from an artifact (Photo: INA).